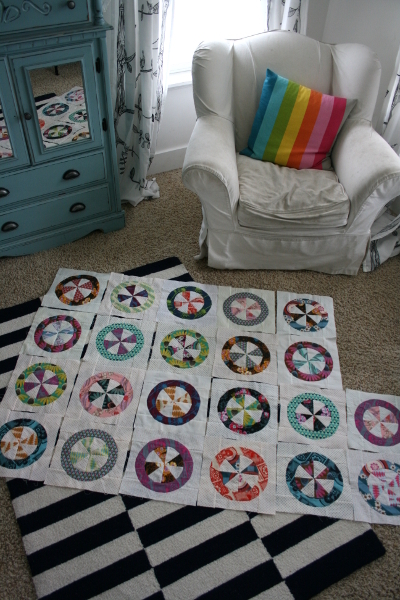 Back in 2007, when my 6th baby was not yet crawling and I’d made my very first quilt, I somehow saw a picture of the Prairie Sweets quilt pattern by Fig Tree Quilts. 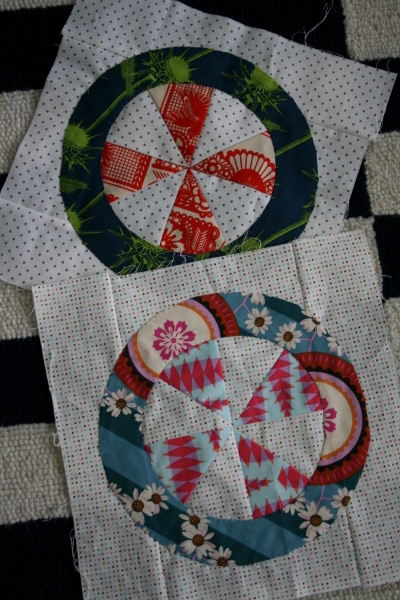 Not yet knowing enough about quilting to have any clue how little I knew, words like applique and circles meant little to me. I just knew I liked the pattern, so I bought it. And it sat for 7 years. Lots of things happened in those seven years. I kept quilting but I never made that quilt, as the words applique and circles came to mean “more work than I have time for” while other patterns grabbed my attention instead. Last year I took an honest look at the pattern, wondering if it was time to get rid of it. I was a little surprised to discover I still wanted to make one. I decided to try having an “on the go” project this year, as I knew I’d spend lots of time in the car and wouldn’t be able to do as much sewing as I would like. I made all the pinwheel blocks and tried glue basting for the first time to secure the rings. So far it’s been an effective way to hold them in place as I’ve been carrying this project around in my car for nine months! 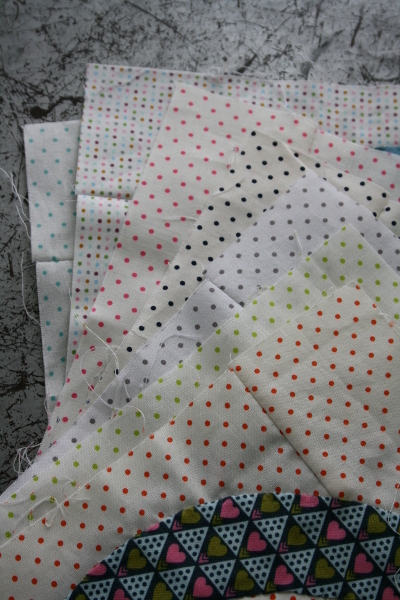 I chose Anna Maria Horner’s Pretty Potent fabrics for the project and the more I sew the more I love it. I’ve got 22 blocks finished, which is about half of them. It was fun to lay them out and see how pretty they all look together! I used a variety of swiss dot fabrics for the backgrounds, and I really love that element as well. It’s been great to have something to keep me busy when I’m sitting in carpool lines at schools or waiting for practices and lessons to end. 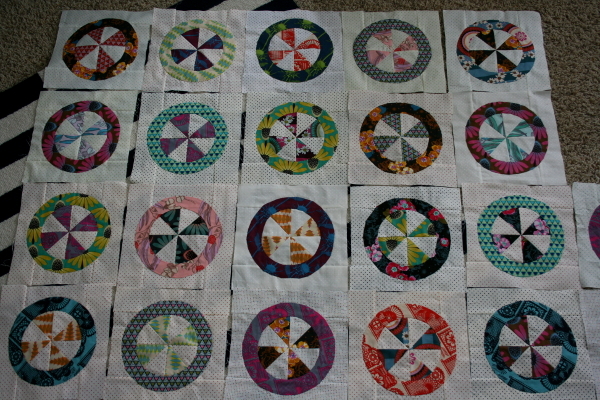 It will be fun to finish the remaining blocks and decide what my next hand sewing project will be! When I work with AMH fabrics, I really get the sense that this lady really knows on a deeper level what she is doing when she is designing her fabrics. I love the swiss dot background fabric… nice choice. Just curious, what applique method did you use to make the rings? I have found myself thinking about your comment for two days now. I couldn’t agree more with your observation about AMH design. I always feel like I’ve learned new things about design after I sew with her fabrics. To make my rings, I cut freezer paper templates and used them to cut & press, and then when I attached them to the blocks I tried glue basting for the first time. I glued just inside where I’d be stitching and it seems to be working well. Hope that answers your question. Very appropriately named – sweet!